I created the website for Shakespeare Magazine, a free online publication that offers an immersive range of features and articles on William Shakespeare. 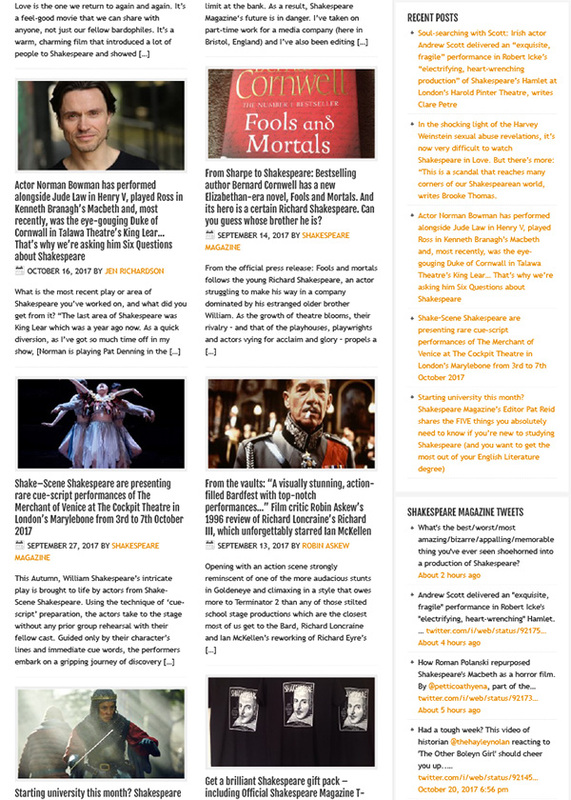 Aimed at the general reader looking to learn more about and enjoy Shakespeare, the website needed to combine a fresh modern look but with a hint of the traditional Shakey fans expect. The magazine was founded and is edited by Pat Reid, a journalist of many years’ experience in music and film. Ahead of the magazine’s first issue Pat had amassed an impressive Shakespeare-based social media following on Facebook and Twitter. The website’s design therefore prominently features links to these accounts and displays the latest Tweets. Shakespeare Magazine itself takes the form of a PDF-based publication distributed through the online publishing platforms Issuu, which always for a more traditional print style layout. The website therefore functions as a news portal, drawing attention to magazine as well as featuring smaller time-specific articles. AS Pat already enjoyed a strong Social Media following the website needed to tap a fresh audience searching for Shakespeare-related information via Google and other major search engines. After a few months, through careful optimisation of the site, the magazine attain a first-page placement for the term ‘Shakespeare Magazine’. Additionally, the site receives hundred of hits a month for a wide range of relevant searches. With Social Media and growing regular web traffic Pat now has more options to monetise the publication. 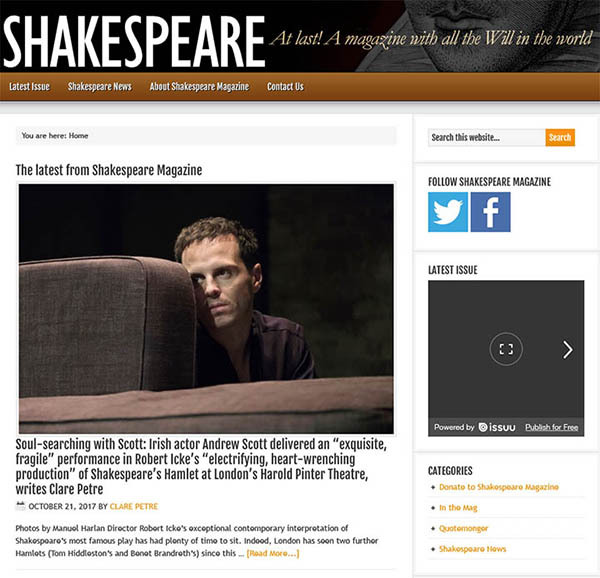 Shakespeare Magazine received a new template based on the popular open source WordPress CMS. WordPress offers fast deployment of websites and there are hundreds of third party plug-ins that cover most things a business needs to do on the web, many of which are free or available for very low cost. It’s therefore a very cost-effective tool as the client need only pay for design, layout and support rather than lots of licences. The WordPress backend is simple enough for most clients to understand. WordPress.org, the downloadable open source software, is of course very similar to the wordpress.com blogging platform – just infinitely more flexible and customisable. Therefore clients can add articles, pages, items to online shops, etc. with little or no extra support. WordPress is a major CMS platform so it’s easy to learn more about it online. WordPress templates are relatively easy to create and can handle small ‘online brochure’ type websites of just a few pages to large information-rich sites, text-heavy or imagery heavy. Templates can also be made to look good on all devices from desktop computers, to tablets to smartphones.